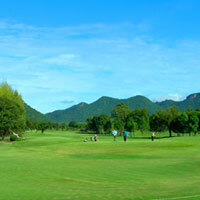 Golf in the world-famous Kanchanaburi Thailand, has been something of a well-kept secret. Those lucky few who have discovered it, have found a new dimension to the game - that only River Kwai, Thailand's premier golfing destination can produce. There are now a number of top quality Thailand golf courses to be found in this region, so variety is not a problem for your River Kwai golf tour. With Golforient, River Kwai golf provides an ideal retreat during your custom Thailand golf vacation. Kanchanaburi or River Kwai has been one of the most surprising golf destinations to our clients. We have recommended golf in Kanchanaburi to many tourists and they are all amazed at the variety, quality, and superb golf values in the area. Please Email us to make an inquiry. We will respond to your Kanchaburi golf inquiry within 24 hours under most circumstances. If you require urgent assistance, please call+66 (0) 2 714 8470. In order to help us organise your golf package as quickly as possible, please provide us with the following information: Number of golfers, golf courses, dates, tee times, hotel required, and any other information you feel appropriate.